I’m a big fan of Google Reader, but the process for adding friends is pretty awkward, and seems to be impacting its uptake – at least for me and people on my social network. Enter my email address – harrybr@gmail.com – as shown below. You have to ‘invite me to chat’. Conceptually this makes no sense whatsoever, but this is what you have to do to become friends on Google Reader. 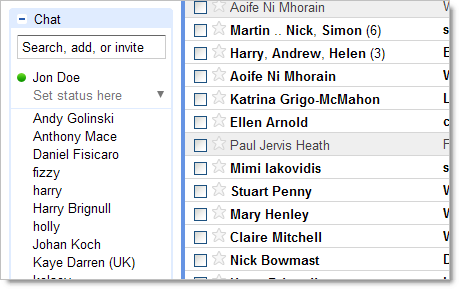 Later on, when you log in to Google Reader, you’ll see I’m there in your friend list. Now we can share links and comments. Hooray, now we can enter an endless cycle of semi-work-related group procrastination! Another bug bear is that your friends shared items appear in separate stream from your main river of news. It’d be nice to be able to tag certain friends so that their shared items appear in your normal folders. Shared items from friends are so much more valuable than any other regular item. It’s a nice way to filter out the good stuff. I tend to get over 6,000 a month and share only 1% of that myself. Wow, thanks everyone – I’m now getting a heck of a lot of shared links! Keep ’em coming!